*Katharina Frei* - Kreatives Sammelsurium: Happy Birthday Cute Card Thursday! Today we are celebrating 1 year of the Cute Card Thursday Challenge blog. Congratulations!! I am more than grateful to be part of the great team. I hope you will also join in the celebration. Various stamp companies sponsored a lot of prizes, so it is definitaly worth a peek. I am honoured that Deb asked me to do a sketch for the celebration and I gave my best to make it a special one :) I was absolutely amazed by the DT creations. They have outdone themselves. Ich bin sehr glücklich, dass Deb mich gebeten hat einen Sketch für die Party zu erstellen. Ich habe mich auch recht ins Zeug gelegt, dass es ein besonderer wird :) Die DT Werke sind atemberaubend. Danke ihr Lieben! 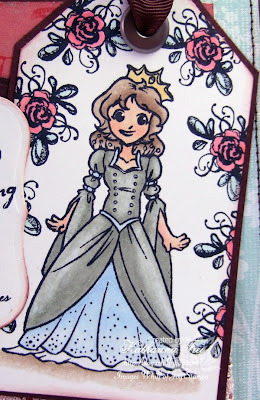 My card features Princess Charlotte designed by Alison Acton for Whiff of Joy Stamps. I stamped her on whisper white cardstock from Stampin' Up and coloured her with Copic Sketch Markers. 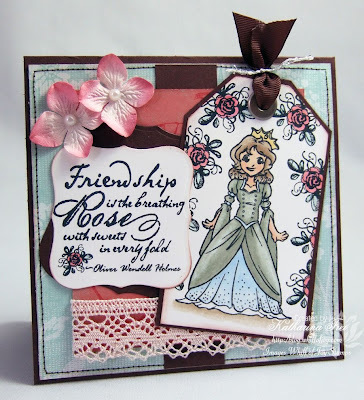 The roses around her are from a Stempelglede stamp set called Friendship Rose as well as the sentiment. I distressed all borders with a brown ink pad. Meine Karte zeigt Prinzessin Charlotte designed von Alison Acton für Whiff of Joy Stamps. 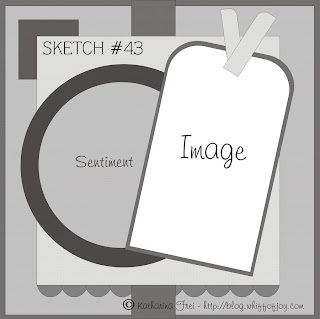 Ich habe sie auf whisper white cardstock von Stampin' Up gestempelt und mit Copic Sketch Markers coloriert. 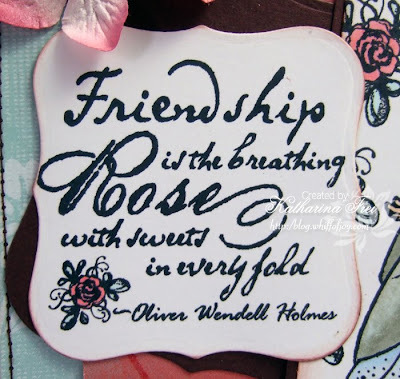 Die Rosen um sie herum und der Text sind von einem Stempelglede Stempelset, das Friendship Rose heißt. Alle Kanten sind mit einem braunen Stempelkissen gewischt. I cut the sentiment with Spellbinder's Labels 1 Nestabilities and also distressed the borders. Den Text habe ich mit Spellbinder's Labels 1 Nestabilities ausgestanzt. Die Kanten sind wieder gewischt. Ich freue mich schon darauf eure Ideen für den Sketch zu sehen! Paper: SU cardstock "close to cocoa", My Mind's Eye Bohemia Collection, SU dp "Afternoon tea"
Oh Katharina your card is gorgeous! And oh my gosh, more guardian angels!! WOOHOO, I love those stamps, can't wait to see all the new stamps. Wow this is a beautiful card!! I love the roses around her! So pretty!! I also love this sketch. Should be fun. The prizes are wonderful!! Stunning card Katharina & thanks for the fab sketch! Thank you for a great sketch Katharina, it was fun to work with. Gorgeous card I love the fairy story feel to it, beautiful! Thank you for your fabulous sketch Katharina, it can't be easy fitting everything into your hectic schedule so it means so much that you spent your precious time designing this for us! It is the most amazing sketch and your card is just stunning, I love princess Charlotte and your card is fit for a princess, beautiful! This is so very precious!! Love your flowers on the tag and the way you've tied off your ribbon!! So stunning!! TFS! ohhh wowww Katharina,what a beautiful card,l love the image and colours. Oh my... Stunning! Love the colors and the details, and the princess Charlotte is just adorable! Love your image and those papers and detail are fabulous! Great sketch :)) and I love your card.Your colouring is amazing. Hai what a beauty is that I love your card she is realy beautiful!! eine wunderschöne Karte, die Farben sind ein Traum. Ganz große Klasse. Dein Sketch gefällt mir super gut und ich musste auch sofort loslegen. Deine Karte sieht super schön aus, das Motiv ist aber auch zu süss. Aww this card is so beautiful! Thank you for a great sketch I really enjoyed working with it!!! Toller Sketch und eine sehr schöne Karte ....Werde mal versuchen diesen Sketch umzusetzen ,darin bin ich echt ein Anfänger.. So very pretty Katharina!! Fabulous sketch too!! This is so pretty and dainty Katharina ;)I love it! This is a great card, I love how you did the princess! This is just stunning Katharina - wish I had your talent! Gorgeous card! Love the colours you've used!